Help fund essential health screenings for local, at-risk children and earn tax credits for your contributions to KCU. Gifts designated to Score 1 For Health are eligible for Neighborhood Assistance Program (NAP) tax credits. Each year, Score 1 For Health provides free health screening assessments to over 12,000 children from low-income, under-resourced communities in Kansas City. When health concerns are identified, Score 1 families are referred to local health care partners for free or reduced-cost medical, vision and dental treatment. 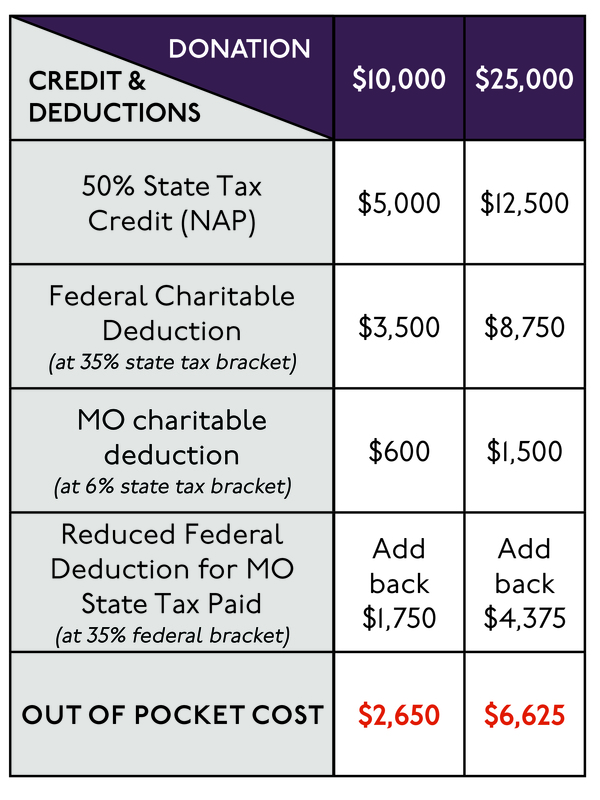 Only Score 1 donations made during the 2018 calendar year are eligible for NAP tax credits. If the credits exceed your total Missouri state tax liability, they may be carried forward up to five years. KCU is approved to offer $100,000 in NAP tax credits, therefore, they will be distributed on a first-come, first-serve basis. Eligible donors are limited to businesses based in Missouri, or individuals who generate income from certain Missouri-based activities. Individuals Who: Operate a farm or operate a sole proprietorship or have a rental property in Missouri. An individual does not need to be a Missouri resident to claim NAP credits. 1. Make a donation of $10,000 or more in support of KCU's Score 1 for Health program. 2. Complete the tax credit application included with your KCU gift acknowledgement letter. 3. Notarize your completed application. 4. Return to KCU the completed, notarized application with original signatures and proof of donation (see application for examples). 5. KCU will mail your completed paperwork to the Missouri Department of Economic Development. 6. Within 3-4 weeks, you'll receive a tax credit certification letter directly from the State of Missouri if you are approved. 7. File your tax credit certification letter with your Missouri business income taxes within 5 years. Certain project costs have been underwritten by the Missouri Department of Economic Development, Neighborhood Assistance Program.